The Vintners Hall of Fame in St. Helena will induct Peter Mondavi Senior tonight after eight decades of making fine wine. Peter is far less famous than his late brother Robert, who was as good at self-promotion as he was at making great wine. 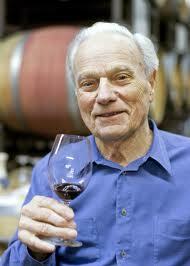 Peter keeps, in his own words, “plugging along” at 97, as president of the Charles Krug winery, Napa’s oldest. He runs the place with his two sons Peter Jr. and Marc. “Peter is really respected among winemakers,” says wine writer W. Blake Gray. He chairs the electoral college of the Culinary Institute of America’s Vintners Hall of Fame, which has selected Mondavi and six others for induction this year. “We can’t ignore the contributions made by Peter, who was a quiet man and an experimenter in the winery,” Gray says.